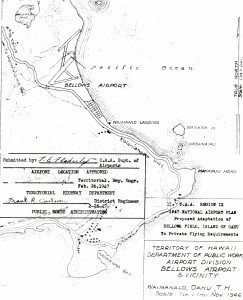 In 1917, a 1,531.71 acre parcel of land on the southeast coast of Oahu was acquired and established by Presidential Executive Order as the Waimanalo Military Reservation. This installation was renamed Bellows Field in 1933 to honor 2nd Lt. Franklin B. Bellows, who was killed in action during World War I while on a reconnaissance flight near St. Mihiel, France, on 13 September 1918. Bellows was a sub-post of Wheeler Field until 22 July 1941 when it became a separate permanent military post. On 26 March 1948, Bellows Army Air Base was redesignated Bellows Air Force Base. In 1958, it was redesignated again as Bellows Air Force Station when its runways were closed, terminating its status as a flying field. During the 1930s, Bellows was used as a bombing and gunnery range by aircraft from Luke, Wheeler and Hickam Fields. On 7 August 1941, a Casual Training Camp was established there to provide basic training for newly arrived casuals (recruits). The original runway was completed January 11, 1933 at a cost of $3,550.07. It was built of coral rock 10-inches deep, rolled to a hard smooth surface and oiled. The runway was 75 feet wide by 983 feet long. During the 7 December 1941 Japanese attack on Oahu military installations, two military members were killed and six wounded at Bellows. 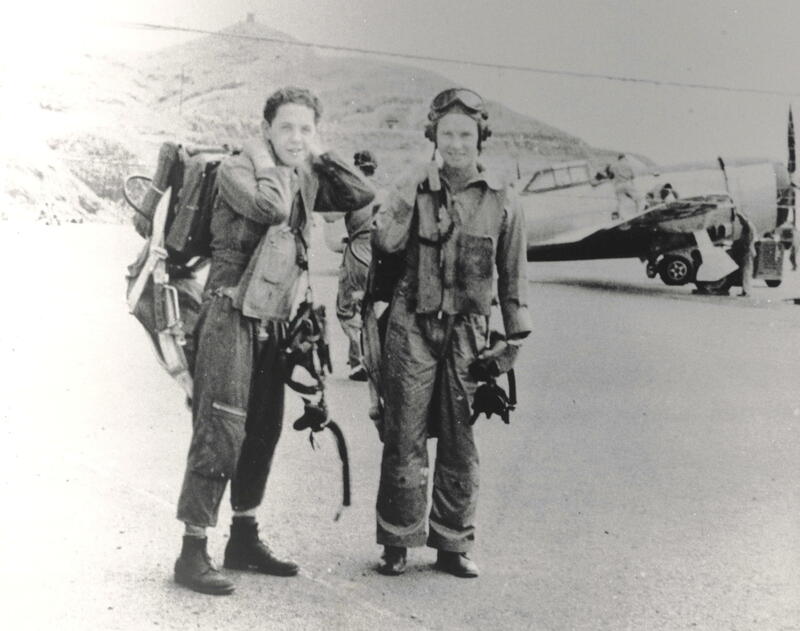 They included three pilots of the 44th Pursuit Squadron who were at Bellows for gunnery training and attempted to take off in their P-40s. One was killed while climbing into his plane, the second was shot down immediately after getting in the air, and the third took off but had to swim to shore when his badly damaged aircraft crashed into the ocean. Also swimming ashore the next day was the commander of a Japanese two-man midget submarine which grounded on the reef off of Bellows. Ensign Kazuo Sakamaki, captured by Lt. Paul S. Plybon and Cpt. David Akui of the 298th Infantry, was a the first prisoner of war taken by the United States in World War II. His companion’s remains later washed up on the shore. Bellows Field remained active throughout World War II, then served as home of the Hawaiian Air National Guard’s 199th Fighter Squadron from 1946 to 1947, before being placed in caretaker status on 15 December 1948. 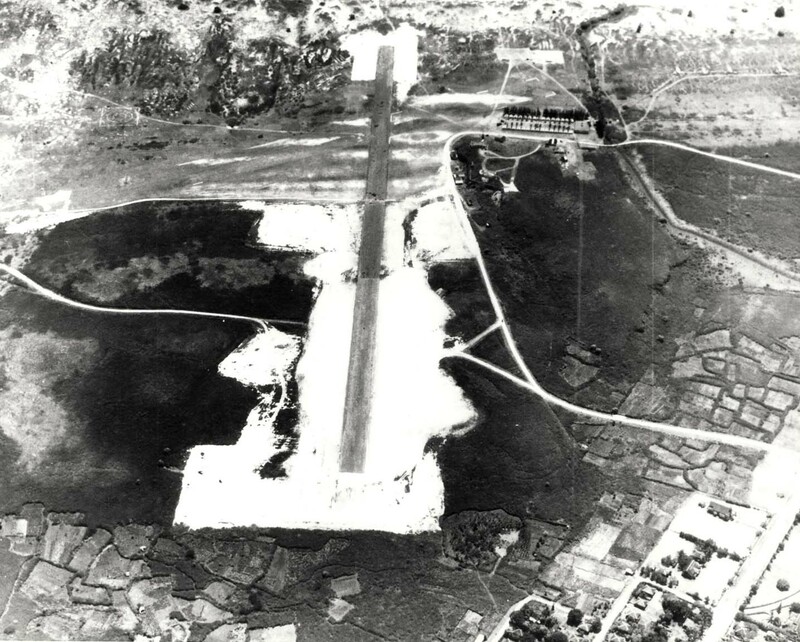 In 1951, the U.S. Marines began using the Bellows runway for air-to-ground training; and in 1958 1st Marine Brigade personnel from nearby Kaneohe Marine Corps Air Station used Bellows as a key amphibious, ground, and helicopter training area. In 1946 the Territorial Department of Public Works proposed the creation, by arrangement with the Army, of a flying facility for private aircraft at Bellows Field. Bellows was constructed by the Army during the early part of World War II. It conformed to Class V standards. The Army indicated that it wanted to retain the field in a commissioned status but that it had no funds to maintain the field. The Army offered the Aviation Unit of the Hawaiian National Guard joint use of the field provided all maintenance was assumed by the Guard. The land occupied by the field was owned by the Territorial Government, subject to the leasehold interest of the Waimanalo Sugar Company, Limited, which would expire within three or four years. “Bellows Field would be an important link in the Kipapa-Haleiwa-Kahuku-Bellows chain of airports for the accommodation of private flying, particularly until such time as the proposed Ala Moan Airport may be constructed in Honolulu,” the Territorial Superintendent of Public Works reported. “Thus far, however, it appears that the Army will not be inclined to cooperate in accommodating personal planes. The Ninth Region CAA will undertake to arrange a suitable joint use as contemplated in the June 26, 1946 letter addressed to all Regional administrators by the Assistant Administrator for Airports. There is no apparent reason why Bellows Field should not be made freely available to personal flyers operating under the Territorial Airport System. In 1947, the CAA Region IX approved a proposed adaptation of Bellows Field for private flying requirements as proposed by the Territorial Public Works Director on February 26, 1947. Although the Territory didn’t own or lease the field, Act 32 of the 1947 Legislature, placed Bellows Field under the management of the Hawaii Aeronautics Commission effective July 1, 1947. The Territory acquired a temporary right of entry for a portion of Bellows Field for use by private aircraft operators and for the instruction and soloing of student pilots. It was officially opened April 4, 1948. There were three runways. Lengths were 6,300, 4,900 and 3,800 feet. Each runway was 200 feet wide. Two of the runways were closed to traffic. 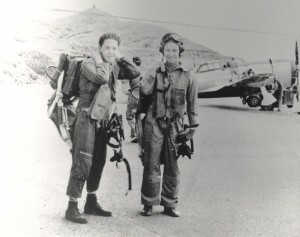 The HAC approved an air show by the Civil Air Patrol at Bellows in June 1948. The license for Bellows Field was approved by the HAC on April 4, 1949. 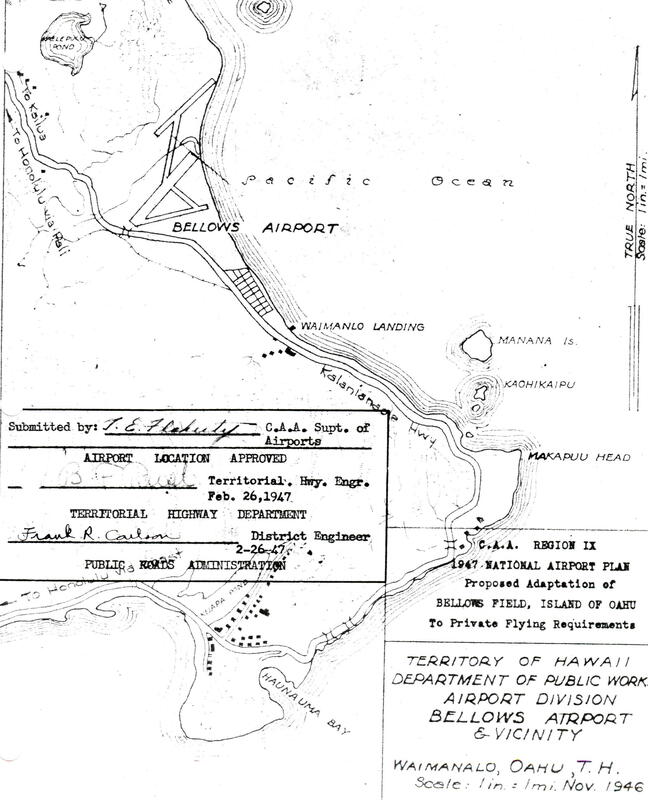 Following a meeting with the CAA, the Air Force, U.S. Engineer’s Office and members of the Hawaii Aeronautics Commission on February 7, 1950, it was decided that the Commission would acquire through surplus that portion of Bellows Field Airport property currently being used by the HAC on a revocable permit basis. Permission for the Territory to use Bellows Field was cancelled by the Air Force in June 1956. This was to permit the Air Force to install its new Globecom System. In 1960, the U.S. Army built two Nike-Hercules anti-aircraft missile sites at Bellows, which were operated full-time by the Hawaii Army National Guard for the aerial defense of Hawaii until inactivated in 1970. The communications transmitter facility, constructed at a cost of $967,380 in 1956-1958, replaced the Kipapa area transmitter and receiver sites. Later it was operated and maintained by members of the 15th Communications Squadron. Its transmitters were the principal ground-to-air link with aircraft (particularly military aircraft) flying to and from Hawaii; and they provided communications for Presidential flights and others carrying high-level government officials. In 1973, part of the Bellows beach area was listed in the National Register of Historic Places as a site of archaelogical significance. Artifacts found there determined the area to be one of the oldest places of human habitation in the Hawaiian Islands. Throughout the 1980s and 1990s, the State continued to try to obtain use of Bellows for a general aviation airport but was never able to get permission from the military. Detachment 1, 15th Support Group, operated Bellows AFS, which was located about 25 miles from Hickam AFB and 8 miles south of the U.S. Marine Corps Air Station Kaneohe Bay. Most of the 1,570-acre installation is on sandy lowland surrounded by wasteland, with the eastern perimeter bordering Waimanalo Bay and the southwest boundary along Kalanianaole Highway, which separates it from the town of Waimanalo. In addition to serving as a training area for the marines and a communications transmitter site, Bellows also housed the Hawaii Army National Guard’s Military Academy and provided an all-service beach-front recreational area for active-duty and retired military personnel, civilian employees of the Department of Defense, dependents and guests. The Marine Corps acquired approximately 1,049 acres of Bellows from the Air Force in 1999. The Marine Corps Training Area Bellows is now part of Marine Corps Base Hawaii, headquartered in Kaneohe Bay. MCTAB adds significant training capabilities and maneuver space for non-live fire military training activities. The Marines and other services use the training areas to conduct amphibious, helicopter, and motorized exercises in conjunction with troop land maneuver training. It is currently the only place in Hawaii where amphibious landings can transition directly into maneuver training areas for extremely realistic military training. Recent improvements to the training area over the old runway include construction of a forward operating base (FOB) mock-up around the old Bldg. 700, Bldg. 700 renovations, and a modular military operations in urban terrain (MOUT) training system that consists of 74 buildings (made from shipping containers) on four separate sites. Additional containers have been moved into the main training area to be used as part of a combat vehicle operators’ course for Marines to simulate driving in real-world conditions. On most weekends and holidays, the Marines continue a practice started by the Air Force to open the 54.2 acre Bellows Beach training area to the general public, in cooperation with the City and County of Honolulu. 2nd Lieutenant Franklin B. Bellows Bellows Field, Oahu, Hawaii was named for Lt. Bellows. Edward Covelsky Remembers December 7 Edward Covelsky recalls the events of December 7, 1941 at Bellows Field. Forrest E. Decker Remembers December 7 Forest E. Decker recalls the events of December 7, 1941 at Bellows Field.